My 1-2-3 Cents : HooOooOoo! 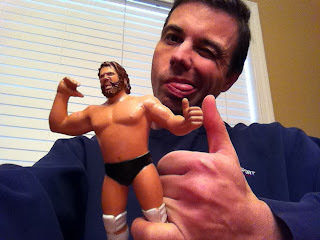 Me & "Hacksaw" tough guy! I've waited for several weeks for a new Hall of Fame inductee to be announced. Finally that wait is over. 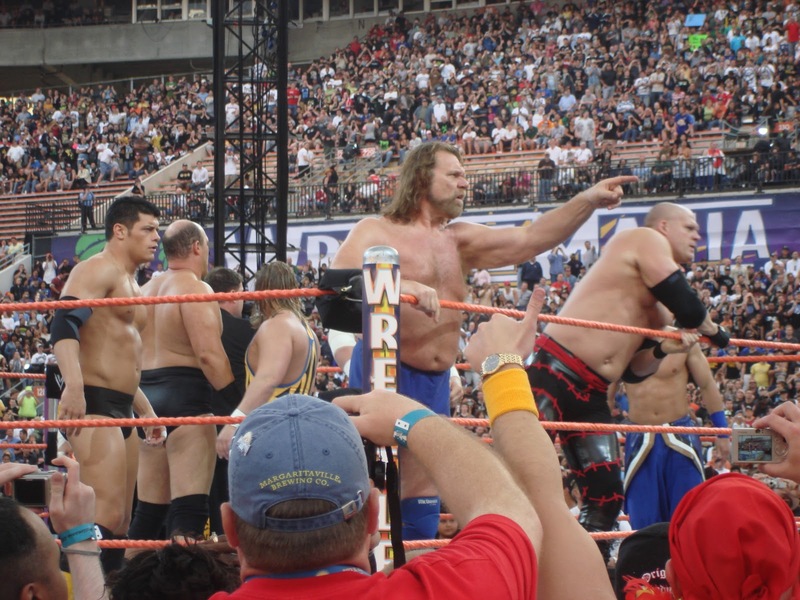 And if you missed it, "Hacksaw" Jim Duggan will join Shawn Michaels in the Class of 2011. I've always been a fan of the "tough guy." I followed him in his days in Bill Watts' MidSouth and then UWF. He battled the likes of One Man Gang, Ted DiBiase, and "Dr. Death" Steve Williams. When Duggan jumped to the WWF in 1987 as a full fledged patriot wielding a 2x4, I was hooked. There was something entertaining about the guy. His feuds with Iron Sheik, Nikolia Volkoff, and Harley Race kept the undercard fun. Who remembers when Duggan and Race slugged it out all throughout the 1987 Slammy Awards show. I remember Race being in a tux and Duggan sporting a tuxedo t-shirt and going toe to toe on stage, in the crowd, and outside the show. It was great. Duggan's biggest claim to fame in the WWF(E) was winning the first ever televised Royal Rumble on USA back in 1988. I had picked either the Ultimate Warrior or Junkyard Dog to win it all. I was happy that Duggan won, as back then I marked for the faces on the card. Duggan also became the "King of the Ring" by beating Haku for the crown. I still have the WWF magazine somewhere with the King on the cover sticking his tongue out with the crown over his eyes and giving the thumbs up. He eventually lost the kingdom to Randy Savage. One other notable Duggan memory was Wrestlemania 5 and his battle with Bad News Brown. He had his board, Brown had a chair and they clashed. When it was over, they both got disqualified. At the end, they cut to a shot of Duggan in the ring and he had a bunch of snot and boogers in his mustache. Jesse Ventura had a field day on commentary. It's something I still laugh about every time I watch the match or think of that day. As you can see, I even had the LJN Hacksaw figure. His plastic 2x4 is long gone though. I remember I had to order that figure off the back of a Pro Wrestling Illustrated magazine as I couldn't find him in the store. Anyway, I was sad to see Duggan leave the WWF in 1993. I'm currently reading Bret Hart's book, and it sounds like he was actually let go. I thought he left to cash in at WCW as the company was throwing around Ted Turner's money picking up all the WWF alumni they could. His run in WCW was successful in terms of winning gold. He beat "Stunning" Steve Austin for the U.S. title and eventually lost it to Vader. One thing I didn't like about Duggan's WCW run was when they turned him heel and had him join Team Canada. It just didn't fit his persona. It was much like Sgt. Slaughter's ill attempt at being an Iraqi sympathizer back in 1991. Duggan has had some health problems too, most notably surviving kidney cancer. If that doesn't make you a "tough guy" I don't know what does. I was happy to see him return to the WWE in 2006 and shout "HoooOoooOooo!" at Lita backstage. He wrestled for a bit too, putting over the younger talent. I got to see him compete in a Wrestlemania preshow battle royal in Orlando back in 2008. The winner got a shot at the ECW title. I may have been the only person in the stadium hoping Duggan won. I'm proud to say I'll be on hand at the Hall of Fame ceremony this year to watch "Hacksaw" take his spot. How do you like, tough guy?